Every fitness buff knows the “feel-good” value of exercise. But did you know that exercise can actually help prevent heart disease, cancer, stroke and other causes of serious illness and death? Sadly, nearly 80 percent of Americans don’t meet even the most modest national recommendations to get 2.5 hours of moderate-intensity exercise each week. Don’t be one of the 80 percent! Think about what kind of condition you want to be in when you’re 50, 60 and older. Then make a New Year’s resolution to join a gym and change your fitness habits. 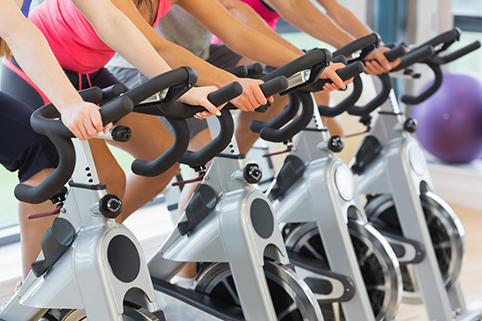 Here are three reasons why joining a gym could be your most important resolution in 2019. 1. You know you want to get fitter. Mortality issues aside, it’s just no fun being unhealthy. Who doesn’t want to be able to kick a soccer ball around with their kid, or be a shoulder to lean on for an aging parent? Many Americans say they want to improve their fitness, as evidenced by annual surveys of New Year’s goals. In a 2017 poll, nearly half of respondents said their top 2018 resolution was to get in shape or lose weight. If you’re one of them, joining a gym can help kickstart your success for 2019. 2. Gyms offer variety to keep you engaged and challenged. No matter what your fitness level or your particular exercise interest, there’s a gym that’s right for you. There are “universal” gyms, that offer the broadest swath of options such as: free weights, fixed weight and aerobics machines, and a plethora of classes, from spinning to yoga. Many even have pools. So, one membership gets you a lot for your money. For those wanting a more intimate or focused environment, specialty studios target specific fitness programs such as Barre’, yoga, or Pilates. Some folks want gender-specific studios, and still others prefer luxury clubs offering a spa-like atmosphere with hot tubs, saunas, and massages. Whatever your inner fitness persona desires, a more tailored gym experience can help keep you excited about your goals. 3. Gyms have never been more affordable. Don’t let costs keep you from joining a gym. There have never been so many programs that provide affordable gym access. Employers, for example, recognize that fit employees are healthy employees, so many offer free on-site gyms or subsidized fitness club memberships at costs well below market rates. For example, through an employer-sponsored program called Active&Fit Direct®, employees can purchase a membership at any of nearly 10,000 fitness centers for just $25 a month. For those 65 and older, Medicare Advantage options like the Silver&Fit® program provide fitness center memberships at no cost or a very low cost, depending on your health plan. If getting fitter is on your list of resolutions this year, check with your employer or your Medicare plan to learn what fitness incentives are offered. Then make your resolution to join a gym, achieve your fitness goals, and reap the feel-good benefits that will improve your life for years to come. Dr. Bjornaraa is senior director, health services with American Specialty Health. She is a physical therapist specializing in fitness, sports and orthopedic injuries as a board-certified sports specialist (SCS). She is also certified as an athletic trainer (ATC) and has worked extensively with various sports teams, traveling nationally and internationally.